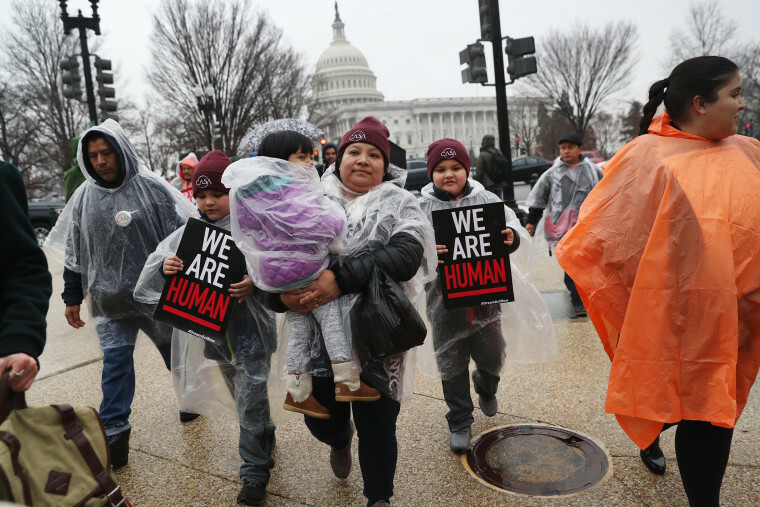 WASHINGTON — The U.S. Supreme Court on Monday declined to hear the Trump administration's appeal of a federal judge's ruling that requires the government to keep the Deferred Action for Childhood Arrivals program going. Under a lower court order that remains in effect, the Department of Homeland Security must continue to accept renewal applications from the roughly 700,000 young people who are currently enrolled in the program, known as DACA. The administration had intended to shut the program down by March 5, but that deadline is now largely meaningless. In a brief order, the court said simply, "It is assumed the court of appeals will act expeditiously to decide this case." Monday's denial also gives Congress more time to come up with a legislative solution, though repeated bipartisan efforts have failed so far. At a White House meeting with governors from around the coutry, President Donald Trump said after the court's decision, "We'd like to help DACA" and criticized the lower court. House Minority Leader Nancy Pelosi, D-Calif., said, "Today's Supreme Court action shows that rescinding DACA was not only legally questionable, but also unjust and cruel. The court's action is welcome news, but only Congress can provide the permanent protection our Dreamers need and deserve." The Supreme Court's denial Monday was expected, because the justices rarely accept appeals asking them to bypass the lower courts. The program allows children of illegal immigrants, known as Dreamers, to remain here if they were under 16 when their parents brought them to the U.S. and if they arrived by 2007. Those given DACA status must renew it every two years. On Jan. 9, a federal judge in San Francisco, William Alsup, ruled in favor of the University of California and its president, former Homeland Security secretary Janet Napolitano. They sued to keep the program going after the Trump administration said in September that it would end it within six months. Alsup said Attorney General Jeff Sessions had wrongly concluded that DACA was put in place without proper legal authority. After the Supreme Court's decision Monday, the White House said, "The DACA program — which provides work permits and myriad government benefits to illegal immigrants en masse — is clearly unlawful. The district judge's decision to unilaterally re-impose a program that Congress had explicitly and repeatedly rejected is a usurpation of legislative authority...We look forward to having this case expeditiously heard by the appeals court and, if necessary, the Supreme Court, where we fully expect to prevail." The Supreme Court has agreed only about a dozen times in the past century to immediately take a case and bypass the federal appeals courts, and those case usually involve a national emergency, such as nationwide strikes in the steel and coal industries. In asking the court to take the case, the Justice Department took another unusual step in declining to ask the justices to block the lower court order in the meantime, which would have allowed the government to shut DACA down as planned. Such a start-and-stop approach, the government said, would frustrate the goal of winding the program down in an orderly way. Monday's action by the Supreme Court leaves the DACA challenge pending before the California appeals court, where it is in the early stages. The Justice Department has said it will take at least another year to get back to the Supreme Court for a decision on DACA's future. If Congress acts in the meantime to extend the program or provide an alternative path to citizenship for its recipients, the legal case would probably be dismissed.